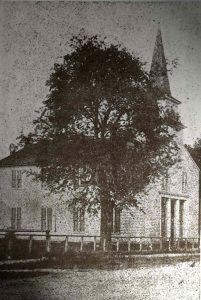 First Baptist Church of Woodbury was established in 1823 as the East Fork of Stone’s River Baptist Church, but dissolved within a few years. It was again established in 1844 as the Baptist Church of Christ at Woodbury. Elder J. M. D. Cates is a founder of the church, and his name is found in the church’s history throughout the mid 1800s. He served as itinerant pastor during several different periods. Church records show evidence of church discipline being administered to wayward members, mostly for public drunkenness, dancing or behavior unbecoming to a Christian. During the Civil War, the records sometimes indicated that there were skirmishes in the area, often preventing the church from having services. The first building was a white clapboard building located where the present sanctuary stands. There are no known pictures of the interior of the clapboard building. Bro. Clinton Wright was called as the first full-time pastor in the 1930s. Prior to that, a circuit riding preacher or bi vocational pastor preached at the church on a schedule that did not include the church having a worship service or “preaching” as it was called every Sunday. In 1938, the clapboard building was torn down, and the present brick sanctuary was dedicated at a cost of $12,000. Much of the labor for the new building was provided by the members. This modern building also had a basement that was used for Sunday School classes. The baptistery was under a trap door on the platform just in front of the choir loft. The first addition to the building was made in 1955, when the one story building to the east of the sanctuary was constructed for $6,000. This building housed classroom space for the young people. At that time, the baptistery was relocated behind the choir loft. In 1960 a two-story building was constructed on the west side of the sanctuary. This building included office space, a nursery and additional classrooms. In 1999-2000, the newest addition was completed on the east side of the building that was constructed in 1955. The Madden Fellowship Hall and the kitchen fill the lower floor, with classrooms on the upper floor. The stained glass windows on the front were given in memory of Miles Melton Jennings. The church name was changed to First Baptist Church in the 1970s. The church’s first organ was a Hammond Spinet model purchased around 1950. Janey Hoover was the organist. When Mrs. Hoover died, a Hammond E-262 Church Model was purchased in her memory. In 1976, a three rank Reuter pipe organ was installed at a cost of $11,000. This was greatly expanded during the 2004 renovation of the sanctuary, and now includes five ranks of pipes and 64 digital stops controlled by a three-manual console with MIDI capability. A Yamaha Conservatory Grand piano was dedicated in 1987. In 2004, the sanctuary was totally renovated in a 7-month project, which included all new lighting, an additional row of seating in the choir loft, a new sound system, renovation of the platform area and stained glass windows. This was the first update of the sanctuary since 1971, when air conditioning and new pews were installed. The worship services of the church would be considered traditional. There are Sunday School classes for all ages. An active Woman’s Missionary Union exists. There are graded choirs for all ages. A three-octave set of Schulmerich handbells is rung by the handbell choir. The morning worship service was first broadcasted over WBRY radio (then WBFJ) in 1963, and continues to this day. 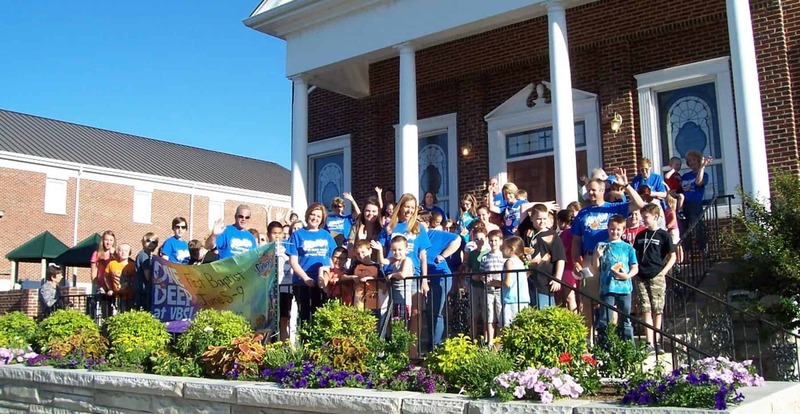 First Baptist Church believes in missions. She has been the mother church to what is now Plainview Baptist Church and Lakewood Baptist Church in Coffee County. The Don Jones family was appointed by the Foreign Mission Board of the Southern Baptist Convention to serve from 1968-1995 as career missionaries in Taiwan. The Glenn Herndon family left for the mission field in Colombia, South America in 1968. Several church members have served as mission volunteers on short mission projects in countries that include Upper Volta, Sweden, Korea, Scotland and Brazil. In addition, members have served across the United States in stateside mission projects.